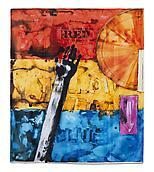 Jasper Johns (b. 1930 in Augusta, Georgia) has been a central figure in contemporary art since he arrived in New York in the early 1950s. He soon began to make paintings that appropriated popular iconography—the American flag, targets, numbers, and letters—quickly announcing himself an important new artist. The Museum of Modern Art, New York, purchased three pieces from Johns' first solo exhibition, at the Leo Castelli Gallery in 1958. John’s style of symbolic motifs has developed into a type of language for the artist that can be traced through his body of work, from paintings, sculptures, prints, and his quintessential ‘combine’ pieces. Johns has exhibited The Museum of Modern Art and The Metropolitan Museum of Art, New York; the National Gallery of Art, Washington, D.C.; the Centre Pompidou, Paris; and the Kunstmuseum Basel. He represented the United States at the Venice Biennale in 1988, where he was awarded the Grand Prize. President Obama bestowed the Presidential Medal of Freedom, the country's highest civilian honor, on Johns in early 2011. Johns lives and works in Sharon, Connecticut, and the Island of Saint Martin.